Situated on a hill at the northern end of town, this monkey infested hilltop wat offers great views of the coastline to the north and south. Browse places to stay in Prachuap Khiri Khan on Agoda.com. Free cancellation. 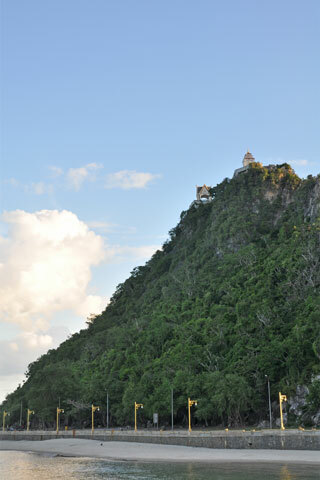 At the top of the 395 steps is Wat Thamikaran, a revered monastery housing a Buddha footprint. The monastery forms part of Wat Thamikaran, sometimes known as Wat Khao Chong Krachok, with the rest of the complex lying to the west of the hill and to the north just over the bridge. The hill is best climbed in the morning or late afternoon, as the views are better then and there’s little shade on the way up. There is a hole or tunnel in the mountain, which appears to reflect the sky and the name of the hill translates as mirror tunnel mountain. The tunnel can be reached from the wat grounds. This wat and hill are completely overrun by monkeys who will not shy from leaping at you and chasing you around; this is definitely not an experience for those with a phobia of monkeys. Don’t carry anything they want -- not even a bottle of water. To get there, walk north along Sarachip Road and you will come to the stairs running up to your right. Browse our independent reviews of places to stay in and around Prachuap Khiri Khan. Read up on where to eat on Prachuap Khiri Khan. Check out our listings of things to do in and around Prachuap Khiri Khan. Read up on how to get to Prachuap Khiri Khan, or book your transport online with 12Go Asia. Planning on riding a scooter in Prachuap Khiri Khan? Please read this. See below for more sights and activities in Prachuap Khiri Khan that are listed on Travelfish.org.